DEO GRATIAS ET MARIAE! I hope this will be the blessing for the whole Church. This is wonderful news. Years of patience and prayer rewarded. Please be assured that your joy is shared by the faithful around the world. I cannot wait for pictures and may I humbly suggest video for the ceremony next week? Welcome Home! Dear Brothers your comunity is one of the essential places of Prayer so badly needed in this world. God Bless your work and Our Lady place you in Her protection. A beautiful news in this great feast of Assumption! Words cannot express how happy I am for you all! God is wondrous in His gifts. Praise be to God! Deo Gratias! I am so very happy for you, and wish you every grace and blessing. This is splendid news - I thank God for the humble patience you have shown. This is so wonderful to read! At last, at last indeed! What a wonderful gift that Our Lady gave to all of you on Papa Stronsay! Congratulations, Fathers and Brothers! And HUGE KUDOS to His Excellency of Aberdeen for his gracious permission! Congratulations, prayers, and best wishes for all the FSSR Community, and a special word of gratitude to His Lordship, Rt.Rev. 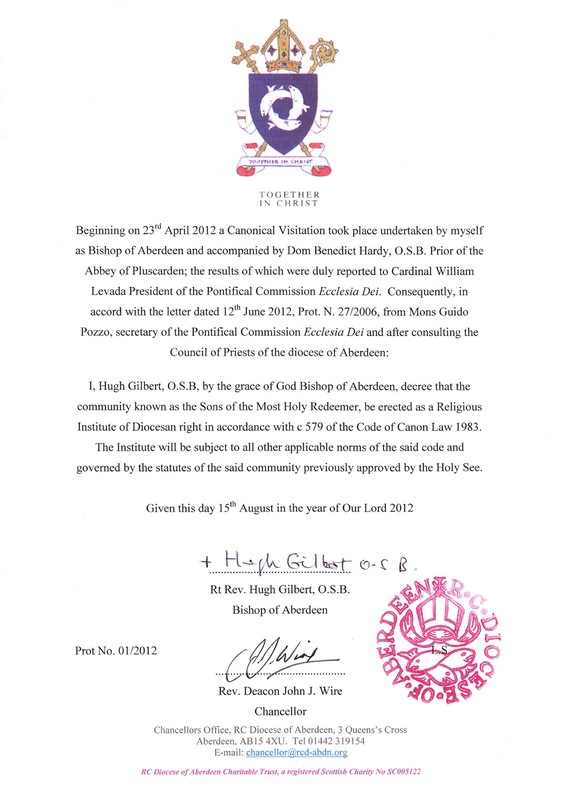 Hugh Gilbert OSB, Bishop of Aberdeen. May our Blessed Lady, whose feast-day it is today, guide and protect the FSSR Community, now and forever. Congratulations once again and a (typical lawyers) Technical question. 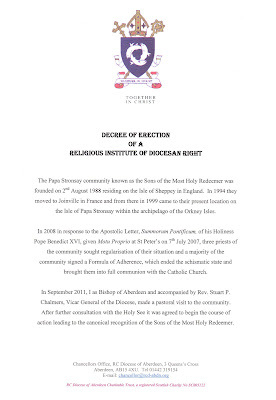 How does your new status as a Religious Institute of Diocesan right affect the status and operation of your New Zealand Monastery. 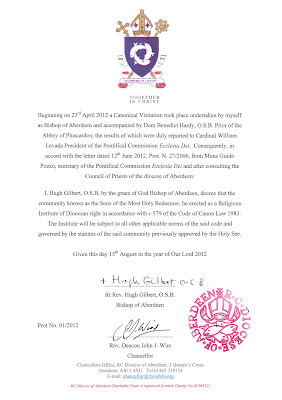 Does that require a separate Diocesan Status in New Zealand or simply permission from the local Bishop for an Institute from Aberdeen Diocese to operate in his Diocese ? Gaudeamus omnes in Domino, diem festum celebrantes sub honore beatae Mariae Virginis: de cujus Assumptione gaudent Angeli, et collaudant Filium Dei. A splendid day, Fathers, God bless you for the holy patience and sanctity you have shown and for all your evident virtues. An inspiration to all of us poor sinners.